In movies, it seems like shooting lights out is a perfectly acceptable way to lower the brightness of a room. In real life, it’s kind of frowned on. But the Bang! lamp lets you act out your movie fantasies of turning off the light like a cowboy without the annoying piles of glass all over the floor. Designed by Bitplay Inc., the lamp features a simple white base and shade. The accompanying remote control looks a lot like a video game controller gun. You point it at the light and pull the trigger to switch the lamp on or off. 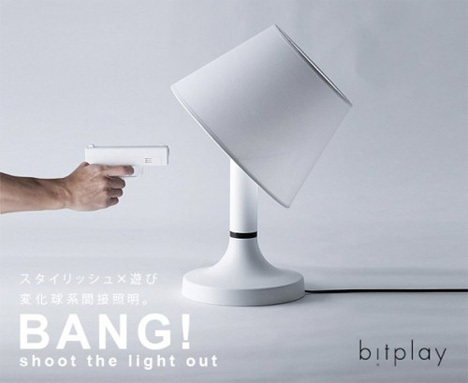 When you pull the trigger, the lampshade tilts to the side to show it’s been “hit.” The awesome light is already in production, but unfortunately for the rest of the world it’s currently only available in Japan.